Calvin Maduro, born Septmber 5, 1974 in the Dutch Antilles in the island of Aruba, is not by anything we could find, related to the dictator of Venezuela, Nicolas Madura — it was admittedly a long shot. Calvin is six feet tall, bats right, throws right and was a pitcher for the Baltimore Orioles but as since retired and now is a scout for the team. His legal residence is in Glen Burnie, Maryland. As a pitcher his stats are very unimpressive with with 10 wins and 19 loses. his ERA was an abysmal 5.78. 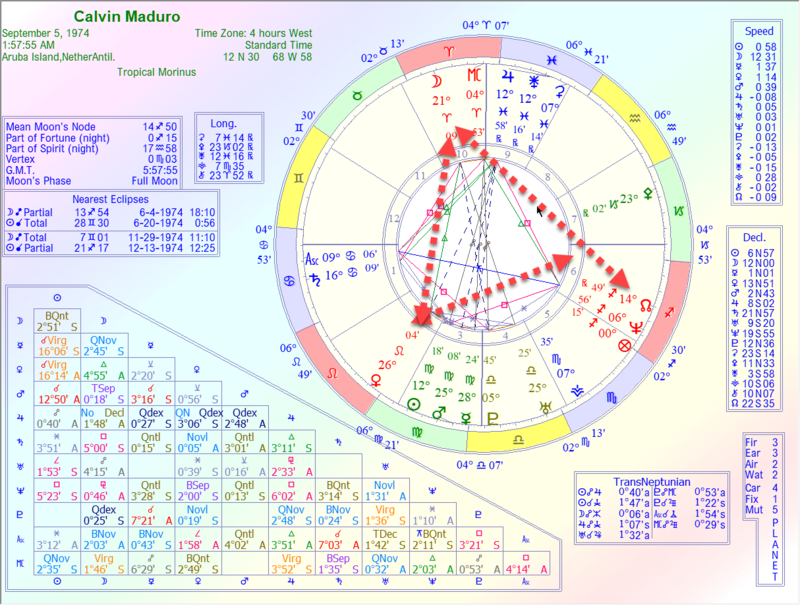 We have rectified him to Cancer 10 and think that his chart would have made him a better catcher than pitcher but it seems that his semi-Grand Trine in Fire was what propelled him onto the mound. The problem there is that it uses the North Node in the sixth, a rather weak mathematical symbol and nothing concrete, but does show how the Orioles farm league made the decision of what position he would play and did not give him a true fleshing out. That is rather odd as the Orioles have traditionally had a good farm system, but then it may have been a situation of bad timing and Madura with a 10 Cancer ascendant, like so many players eager to make the Big Show, would not have registered too many complaints. He is a Splash Temperament type and we believe that this and his own bad experience makes him good in his new career where he has a greater voice (Neptune in the sixth) in his and his findings future. We wish him all the best.